The Husky 17-Piece Mini Precision Folding Hex Key Set features an 9-Piece SAE and 8-Piece Metric alloy steel for strength and durability. The tools have chamfered edges to help guide the tool onto the fastener. These sets include SAE sizes of 0.050, 1/16, 5/64, 3/32, 7/64, 1/8, 9/64, 5/32, 3/16 and MM sizes of 1.5 mm, 2 mm, 2.5 mm, 3 mm, 3.5 mm, 4 mm, 4.5 mm, 5 mm. 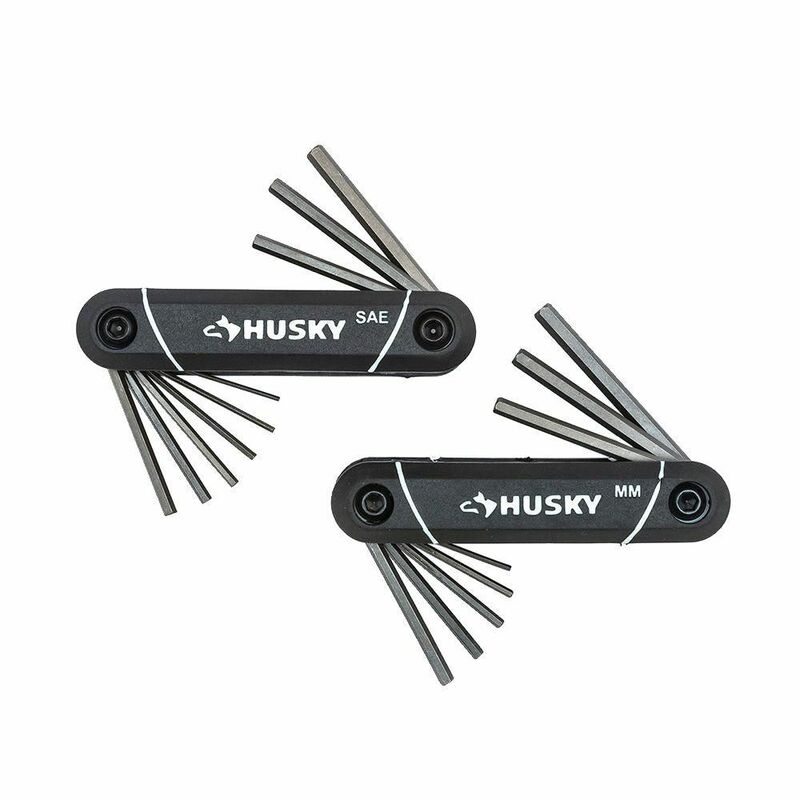 HEX SET FOLD MINI SAE/MM 17-Piece The Husky 17-Piece Mini Precision Folding Hex Key Set features an 9-Piece SAE and 8-Piece Metric alloy steel for strength and durability. The tools have chamfered edges to help guide the tool onto the fastener. These sets include SAE sizes of 0.050, 1/16, 5/64, 3/32, 7/64, 1/8, 9/64, 5/32, 3/16 and MM sizes of 1.5 mm, 2 mm, 2.5 mm, 3 mm, 3.5 mm, 4 mm, 4.5 mm, 5 mm.